19 He prepared a divinely inspired plan; two tigers must still yield to one dragon. His exploits were already legendary, despite being new on the scene; it is only natural that he would divide his ding tripod, and share the pieces with the orphaned and the destitute. 20 Gong Jing had finished handing out the rewards for meritorious deeds to all of the troops, so Zou Jing wanted to return. Xuande said, "I recently heard that the palace guard commander Lu Zhi was fighting the bandit rebel leader Zhang Jue in Guangzong. I was a former pupil of Lu Zhi, so I would like to go and help him." Thereupon, Zou Jing returned home with his army; Xuande, Guan and Zhang set out for Guangzong, leading their core cadre of 500 men. They arrived in Lu Zhi's camp, and entered his tent to pay their respects. When they told him their reason for coming, Lu Zhi was overjoyed. He stayed behind with them outside of the tent so that he could listen to their story. This is one of four great novels from China, published when it was the most highly civilization in the world. 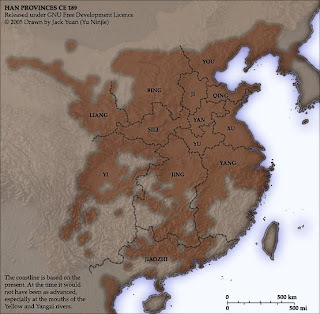 Map shows China at the time of this story. Chapter Summary: Three brave men swear an oath of allegiance at the feast in the peach gardens; our heroes' first achievement is the vanquishing of the Yellow Turbans. This translation from Wikipedia. See license CC-BY-SA.